Kawasaki Precision Machinery produces high quality hydraulic components for applications requiring high power and precise control. Designed for operation in the most rigorous of operating conditions, Kawasaki's hydraulic components are market leaders in reliability and controllability. 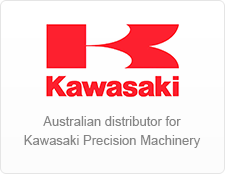 As an authorised distributor for Kawasaki Precision Machinery in Australia, Hycon Hydraulic Systems stock an extensive range of genuine hydraulic pumps, motors and parts for use in excavators and other mobile equipment such as cranes and crushers. Kawasaki hydraulic components have been specifically designed and used in Volvo, Hyundai, Kobelco, Sumitomo, CASE, Daewoo, Doosan and Samsung excavators, Tadano and Kobelco cranes, Extec crushers to name a few. Buy genuine Kawasaki parts and components at competitive prices and benefit from rapid delivery direct from our Perth warehouse. We stock genuine replacement parts and a large selection of complete pumps and motors for the models listed below.